Are you one of those who perpetually laments the fact that all your favourite restaurants shut down one after the other? Or the good, ol’ eateries are just not up to the mark these days? Well, fear not, for there is hope still lurking in the quaint, quiet bylanes of South Mumbai with mind-blowing Parsi food that is sure to throw you off that diet immediately. This is a little takeaway counter that is located at the end of the lane just before Kandeel Juice Centre in Fort. For many an office-goer, they have chanced upon Grub Corner while rushing off for a courier or taking a shortcut to the many banks in the area. But no matter what the agenda was, or how great the hurry, it’s impossible to pass by Grub Corner without at least parcelling their delicious chicken puffs, mutton cutlets, chicken farcha, egg-chutney-potato pattice or a ham-and-cheese sandwich. 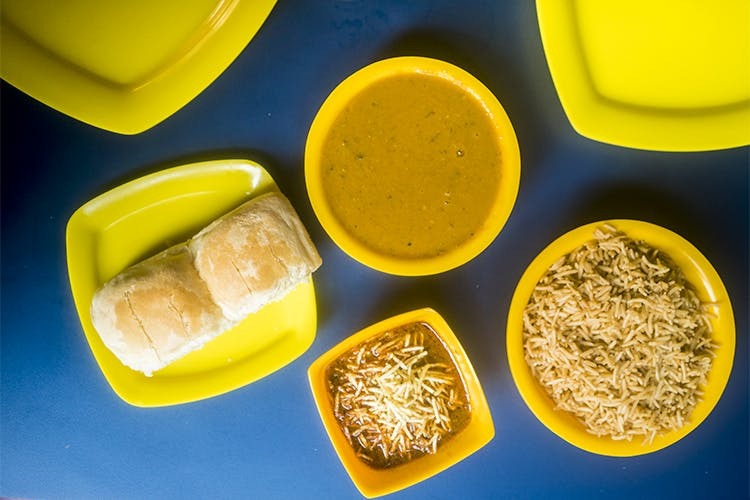 The place also has main course dishes such as dhansak-rice, papeta par eeda, biryani and more, and also sells a range of pickles and bakery products from Pune’s iconic Kyani bakery. Another fun fact: Most of the food is freshly prepared either by the owner’s family or Parsi ladies who supply it from their homes daily, making this place as authentic as it gets. You could call in advance and reserve your order, as all their stuff gets sold out in a jiffy (well before 4 pm). The place is closed on Sunday and there is no parking, but you can stand on the stairs leading up to the counter (if you find a place) and wolf down your stash. All items cost below INR 100 (most below INR 50). First off – don’t go for the plush, AC ambience or expect a fine-dining experience at this little place in Fort. Piccolo is focused on home-style Parsi food from the heart and most people prefer a quick takeaway to relish in the comfort of their homes or offices. Mutton cutlets, chicken cutlets and chicken sandwiches are a must-try, and most of the items of the menu are available for less than INR 100. The joint also does special orders for festivals like Christmas and New Year, and their roast stuffed chicken with exotic veggies, potato wedges and brown sauce is one heck of a treat! Parking may be an issue, so don’t take your car. With branches at Colaba and Hughes Road, RTI is a true icon of Parsi hospitality and charitable purpose. Offering delicious food at reasonable prices to hungry Mumbaikars passing by, or sometimes traveling all the way from far-off locations just to partake of the goodies, all the proceeds from RTI go towards the betterment of the Parsi community. If you happen to be in the area, do drop by for their chicken cutlets, chicken farcha or dhansak or you could even order their roast chicken and Christmas pudding when the season rolls around. Most items are available for less than INR 200, in order to cater to those even on a tight budget. PAC located in the heart of Tardeo is a little takeaway joint that you probably haven’t had a clue about. However, whether you are craving chicken potato pattice or frilly cutlets or are in the mood for some superb continental fare like a hearty chicken and mushroom pie, PAC has just the goods to take you to your happy place, that too at prices that don’t breach the INR 200 mark. There is no parking or home-delivery, and the goodies do disappear in minutes right before your eyes, so go early so as not to be disappointed. Think no-frills, no-fuss yummy Parsi food in the heart of Colaba, and Paradise is what should come to your mind. Dishing out Parsi favourites like dhansak, sali boti and patra ni machi for decades, nobody has a word of offense against the slack, laid-back service that this eatery has always had, given that the food more than makes up for it. If you’re not in the mood for a sit-down meal, especially given the fact that there is no parking available, do pack some lunch or dinner when in the area, and while you’re waiting, be sure to pop a couple of delicious mutton samosas (they are also sold by the dozen, their popularity unrivaled even by the Muslim joints in the area). Home-delivery is available, however. A meal for two should set you back for about INR 500.